By performing a training session you give the body a stressful stimulus or ‘shock’ to disturb its normal state (also known as homeostasis or equilibrium). After the immediate fatigue, the body responds by adapting during recovery so that it can cope with a larger training load next time. This is called super-compensation, because when the body’s energy, muscular and cardiovascular systems rebuild, they make themselves stronger and more capable than before the training took place. Training, especially High Intensity Training (HIT) is stressful, and deliberately so, as it provides a powerful stimulus for adaptation. 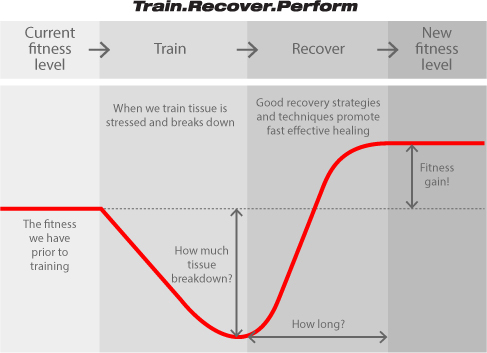 The stressed state of the body persists for many hours, or sometimes days after the training stimulus has been applied. The rate or amount of recovery depends on a number of factors, including quality of sleep (especially slow wave sleep), diet, and the level of training to which the person is accustomed. Whilst the body is stressed, the sympathetic ‘fight or flight’ branch of the nervous system is more active, and the parasympathetic branch is less active, but balance is gradually restored during recovery, eventually rising to a level above where it started, in line with the effect of super-compensation. Stress can come from multiple sources – it can be physical e.g. from training intensively, or it can come from chemical sources such as poor nutrition or too much alcohol and also from mental sources such as work or relationship stress. If the total amount of stress gets too much, combined with too little (or ineffective) recovery, the downwards spiral towards overtraining begins. 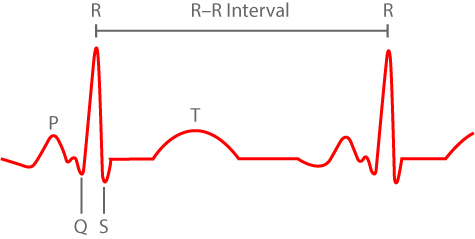 Unlike measuring resting heart rate (HR) which is an imprecise mix of multiple elements, HRV is so useful because it allows monitoring of recovery via changes in the timing of each heart beat when breathing slowly in and out (figure 1). These small changes in beat to beat timing can be detected using finger pulse or chest strap heart rate monitors. By measuring HRV at the same time every day and comparing to your normal level, you can tell how stressed or recovered you are. Perhaps counter intuitively, less variation is a bad thing, so if someone’s HRV is below his or her normal level, they are more stressed than normal, so they need more recovery before they are ready for an intensive session. On the contrary a high HRV level shows the body is well recovered and ready to respond to any demand placed upon it. Training should not feel harder than it needs to in order to produce the gains in fitness and performance that we are all looking for. The mantra ‘no gain without pain’ is not only outdated, it’s wrong and potentially damaging to long term health. So the question now is – how to decide which sessions to go hard, and which to go easy to produce the biggest gains in the shortest time? The answer is to use daily ithlete HRV measurements. The application of ithlete HRV is simple: on days where your HRV is at or higher than your normal baseline, do the harder or interval sessions from your training plan, and on days where HRV is below normal, perform easy sessions or take a complete rest. Exercise scientists have also noted that training hard on days where your body has sufficient reserves is easier to perform, and is likely to produce bigger performance gains than if you try to perform those sessions when tired. On the other hand, easy aerobic training actually stimulates recovery (as well as the ability to use fats as fuel) better than complete rest. Who wouldn’t prefer to work in sync with their body and see bigger rewards?